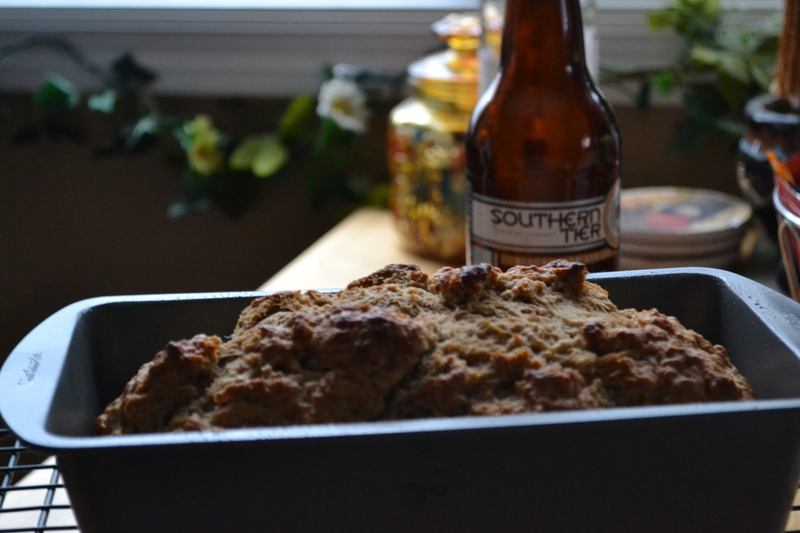 The Best Sweet Beer Bread. 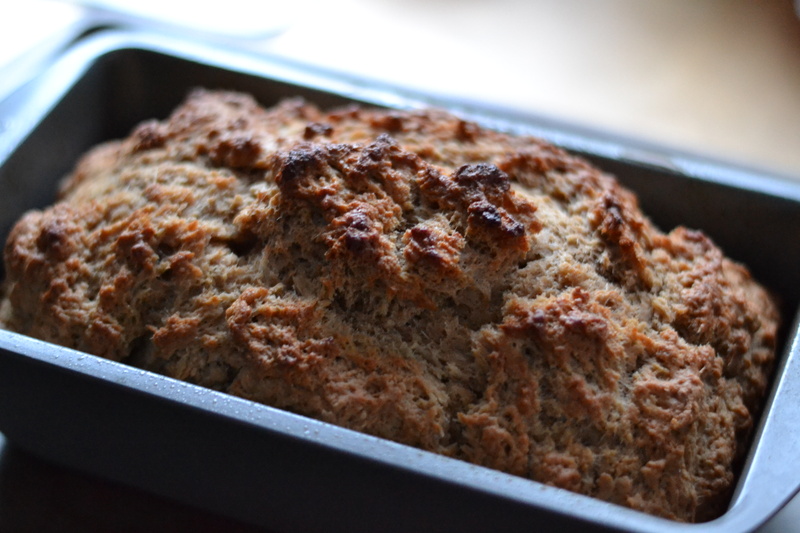 Ok, so I know I said that last week I made the Best Beer Bread, and I still stick to that claim. However, the other day, I tried again, with a different beer this time – something just a little more dessert-like. What was the beer, you might ask? 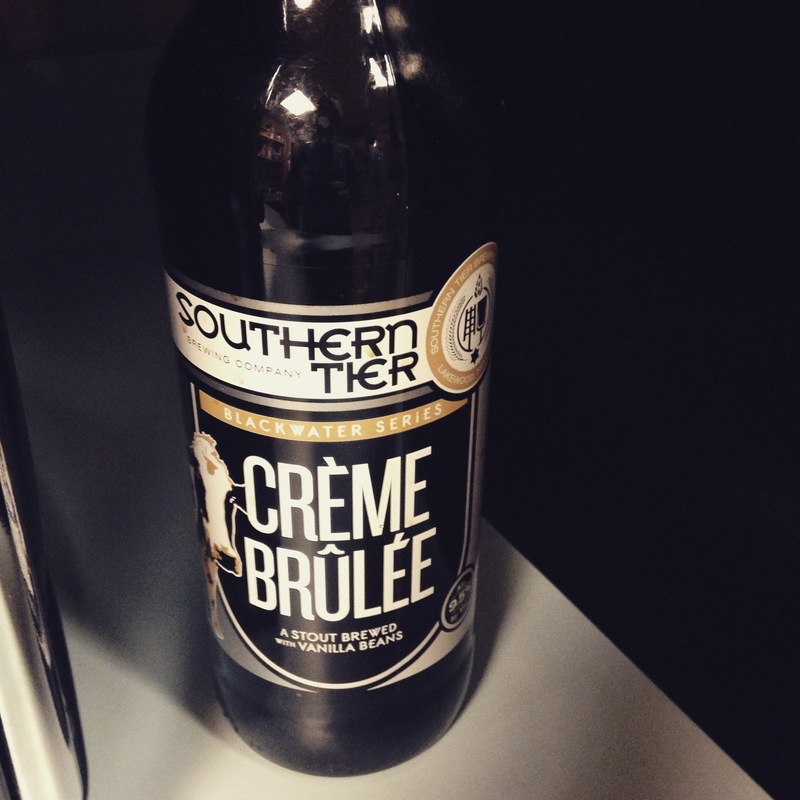 Why, it was Creme Brulee Stout, by Southern Tier Brewing Co.
Well, needless to say, the beer was delicious, and I was even more excited now to see how the bread would turn out! It smelled amazing, and it appeared to have been baked to perfection. Now, the hard part – waiting for it to cool, so I could try it. Finally, the cooling hour had come. It was time. Time to slice. Time to taste. Time to judge and be judged. Well, it was definitely worth the wait. 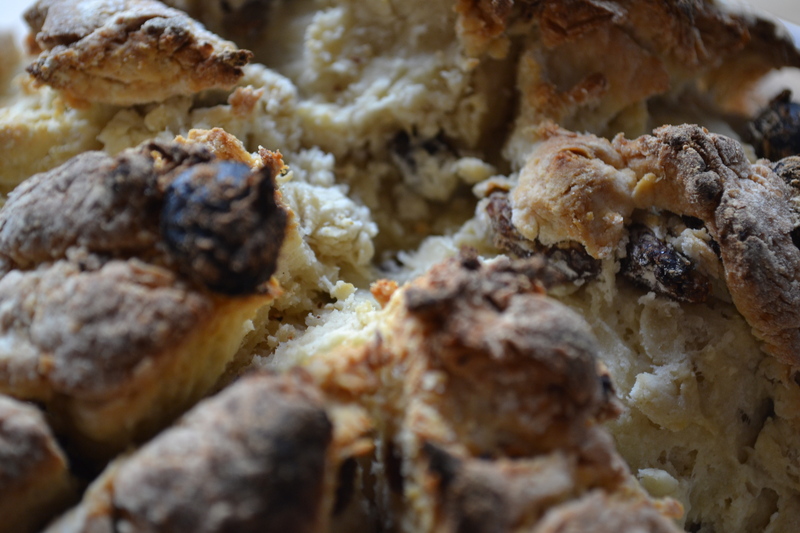 It’s hard to say at this point which beer bread was the actual best – I think it all comes down to personal preference. This one was a little sweeter, which, anyone who knows me would know that sweeter is my bag. Not everyone digs on sweeter though, so let’s just call it a draw. 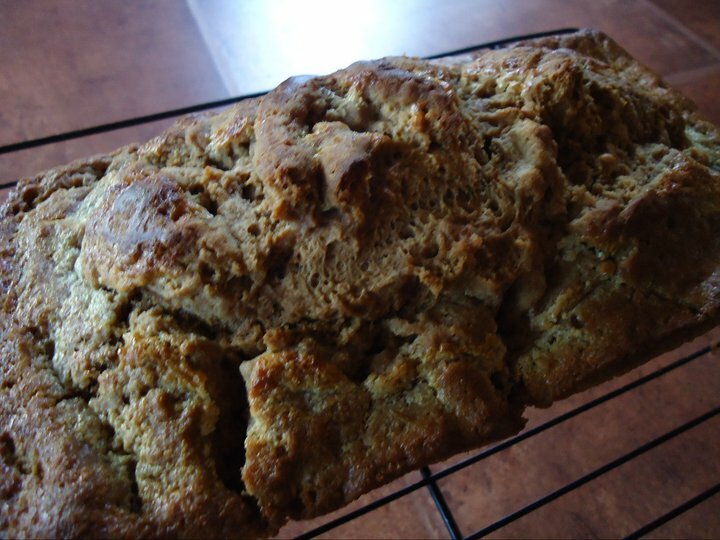 This one shall be bestowed with the title of Best Sweet Bread Bread. 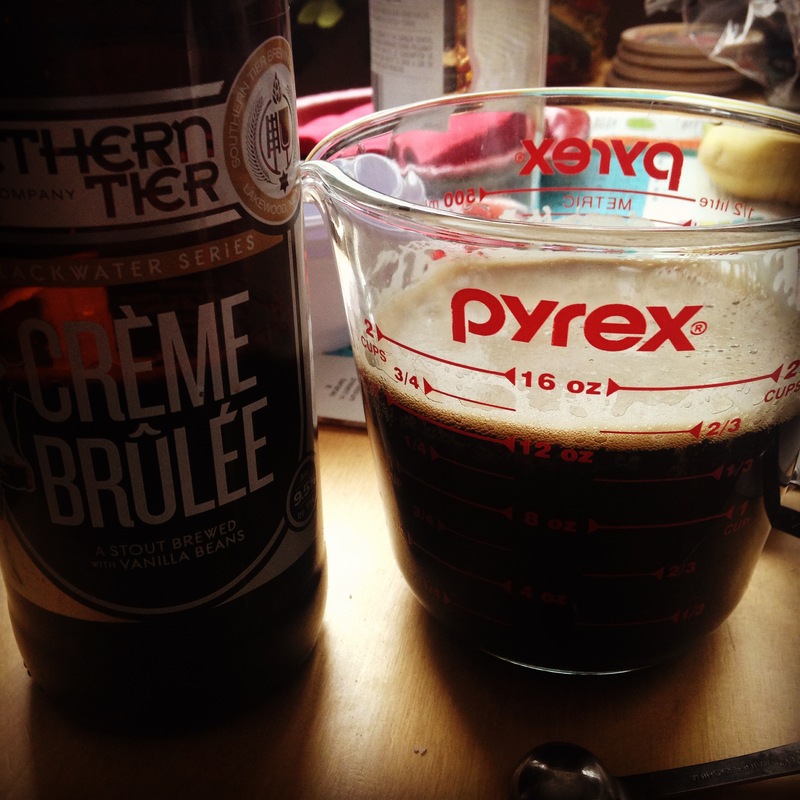 If you’d like to try is, use the same Beer Bread Recipe as previously posted, but use the Creme Brulee Stout. Remember to only use 12 oz – and to drink the rest. Never let great beer go to waste. 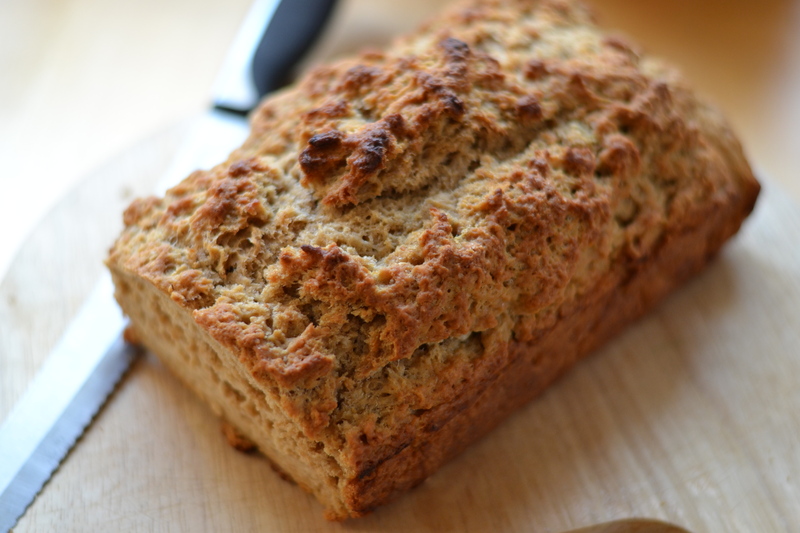 Recipe: The Best Beer Bread. Preheat the oven to 375. In a Large mixing bowl, whisk together the sifted flour, baking powder, salt, and sugar. Pour in the beer, and mix with a spatula until it gets thick, then finish mixing it by hand, until it forms a somewhat flaky-ish ball. 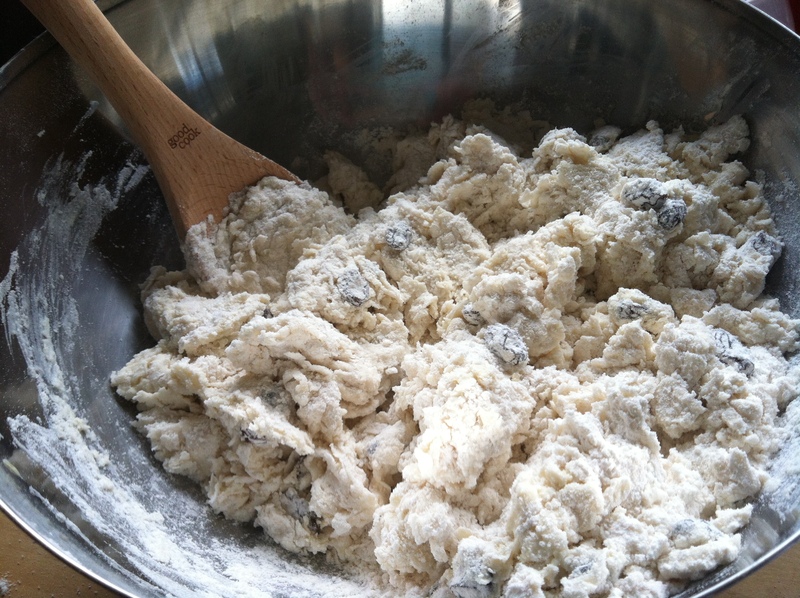 Grease a loaf pan, and pour dough into the pan, spreading it out evenly with your hands. Pour the melted butter on top. 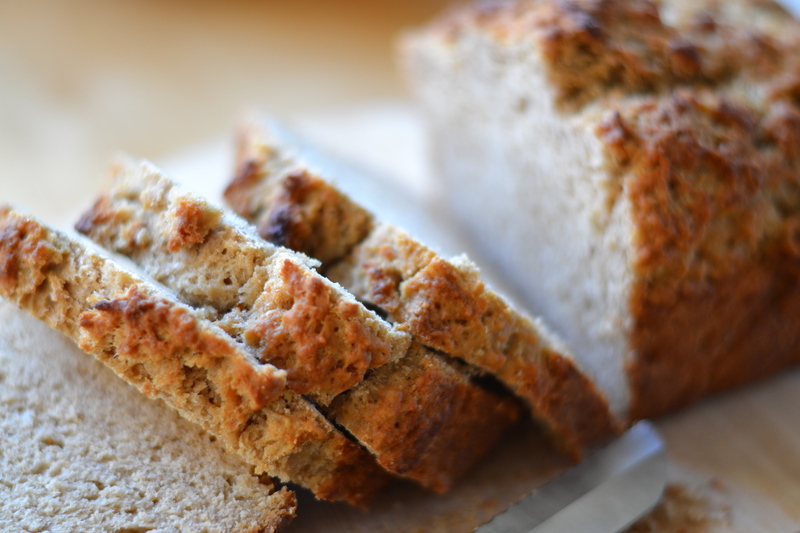 Place the loaf pan on a sheet pan (sometimes the butter overflows while baking) and bake for approx 45 minutes, or until a toothpick inserted comes out clean. 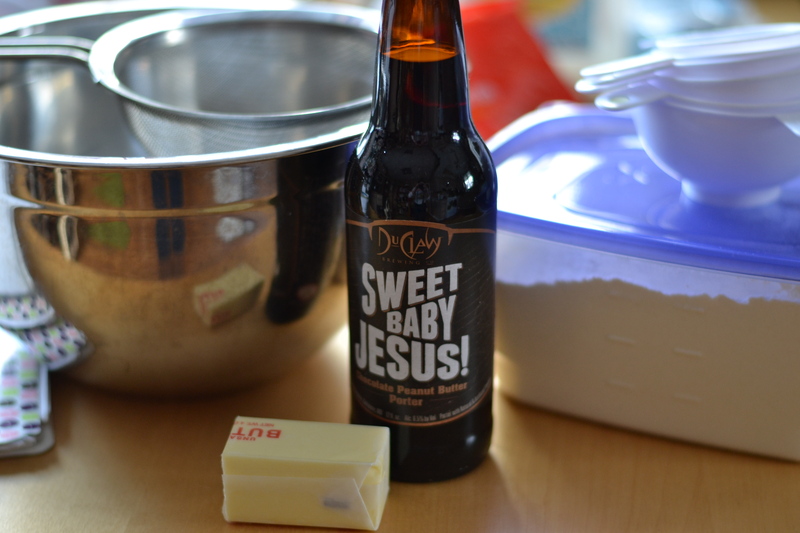 Sweet Baby Jesus Beer Bread. I forgot how good Beer Bread is. The other day, I was home from work, and really wanted to bake something, but I didn’t want anything super sweet or that took too long to make. 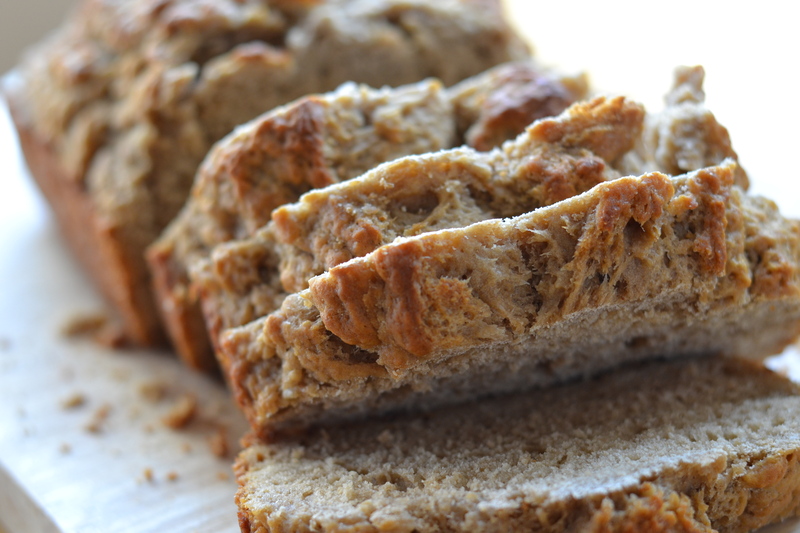 I began flipping through my binder and came across this old recipe I had for Beer Bread. I’m not even sure where it came from, I’ve had it for quite some time – it was pre-pastry school! But I remember it being extremely delicious, and not super complicated. Being engaged to a complete beer geek, I was also 100% sure we would already have some kind of beer in the house that would work perfectly. Little did I realize just how perfectly. In the fridge, I found a six pack of Sweet Baby Jesus! It’s a chocolate peanut butter porter, and if I remembered correctly, the beer bread tastes best with a darker beer. Not only was this one dark, but chocolate AND peanut butter??? The planets could not have been more perfectly aligned. I went forth and crafted the dough. I greased the loaf pan, put the dough in, drizzled melted butter on top, and baked it. Not until after I tasted the dough though. A few times. This was some good dough. I just loved the way it looked, fresh out of the oven – kinda like how I imagine the surface of the moon. Only much tastier. I let it cool, and waited patiently for my fiance to get home, so I could show him what I made, and more importantly, we could eat it. After what seemed like an eternity, he came home from work, and we sliced into the bread. This was not good. I mean, it was really really good, which made it not good, because I did not want to stop eating it. It also inspired me to start thinking about other beers that would work well in the recipe….a whole line of craft beer breads…I think I’ve found my true calling. the best thing since sliced beer bread. 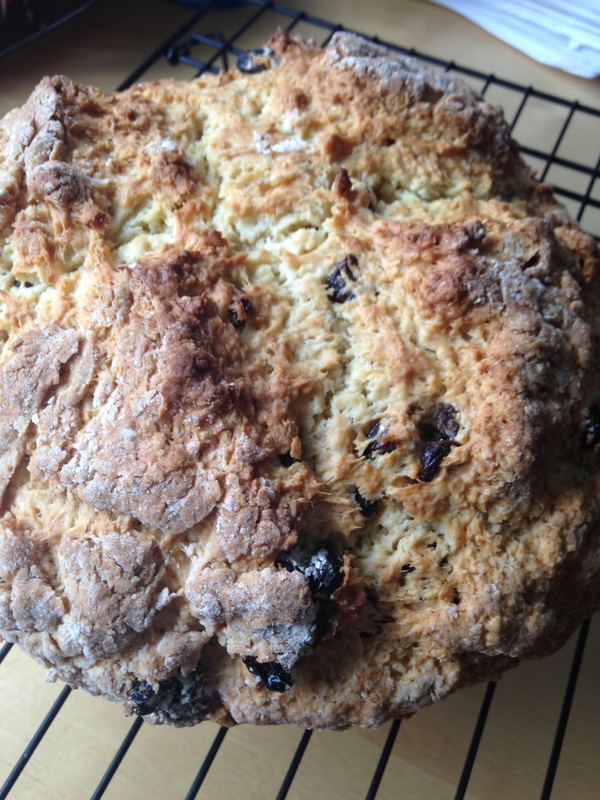 Irish Soda Bread: Take 3. 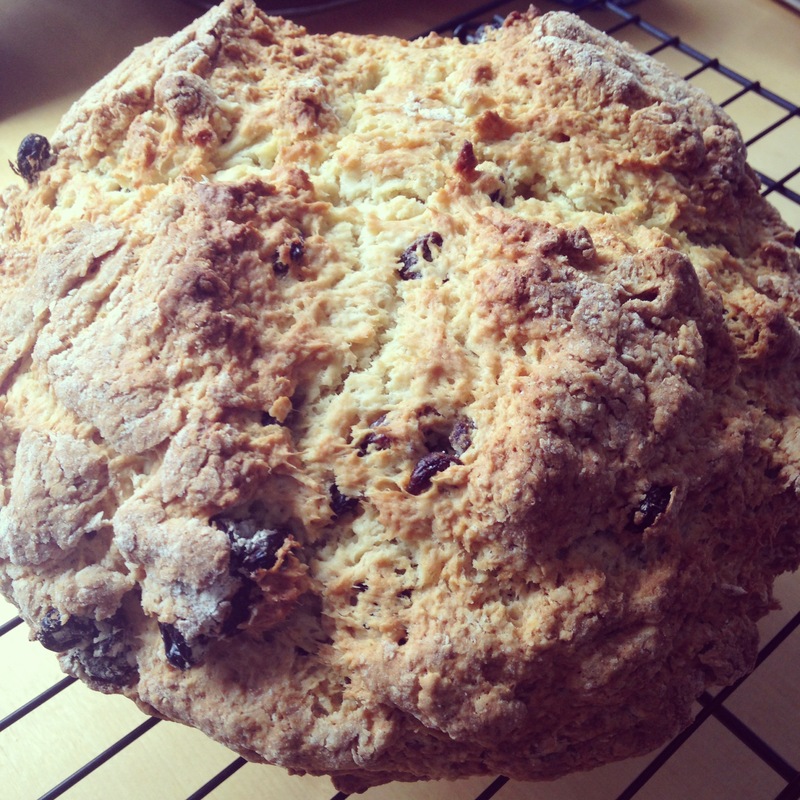 So I think I’ve kind of started a tradition of baking Irish Soda Bread for St. Patrick’s Day ever year. This is the third year in a row now that I’ve done it, and it appears that it’s true what they say about the third time being the charm. 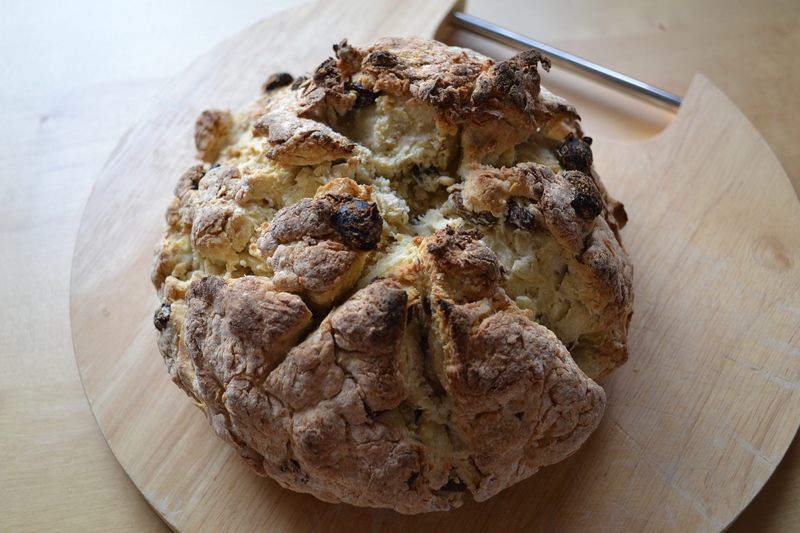 once, twice, three times a soda bread. Not that the first two attempts were failures, by any means. But there’s something special about this third one. 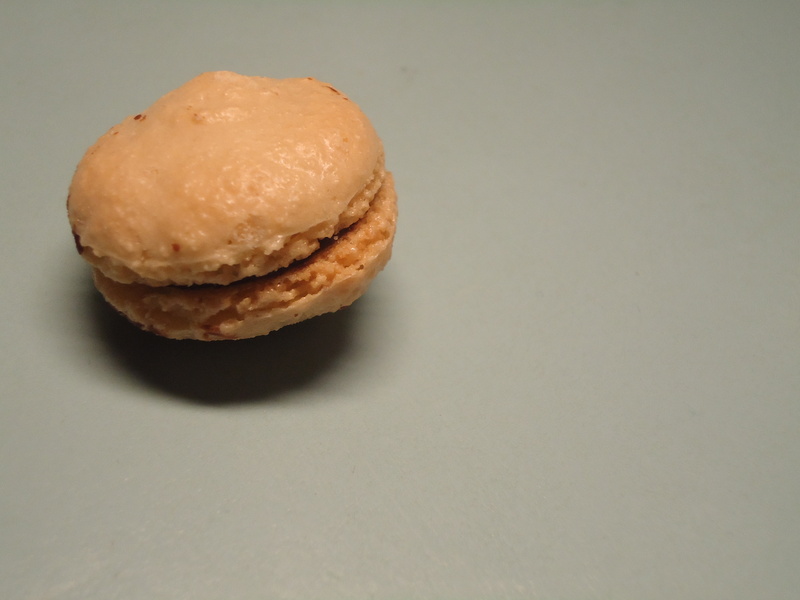 It’s more golden, its more evenly shaped, and if I’m going to be completely honest, it tastes better. At least I’m pretty sure it does – it’s hard to remember exactly when the last time you’ve eaten something was a year ago. But this one tastes spectacular – and I really don’t remember being quite so blown away by Year #1 or Year #2. I can say that it was finally getting the recipe exactly right that really made it stand out this year – and that would be partially true. But the reality is that this year, I used a different base recipe – something a friend wrote on a piece of paper at some point and I found in my binder, stuffed in the front pocket, with a slew of other random and un-filed hand-written recipes, some by me, some by others. The ingredients were pretty much the same, with some of the amounts being a little different, and the method of production being different as well. It was actually much less complicated, and more of a “throw everything in and mix” kinda thing. I like that. But as I often do, I had to make a few slight adjustments for things I didn’t have in the house. I did not have buttermilk. But I know that milk + vinegar = buttermilk. I definitely had vinegar; but alas, I had no milk. I thought I did, but there was only half and half. I really wanted to make the bread, and I only had a specific window of time to complete this task in, so, I just plowed ahead, half and half in hand. I also did not have quite enough raisins. but I’m ok with that and would have probably used less anyway. 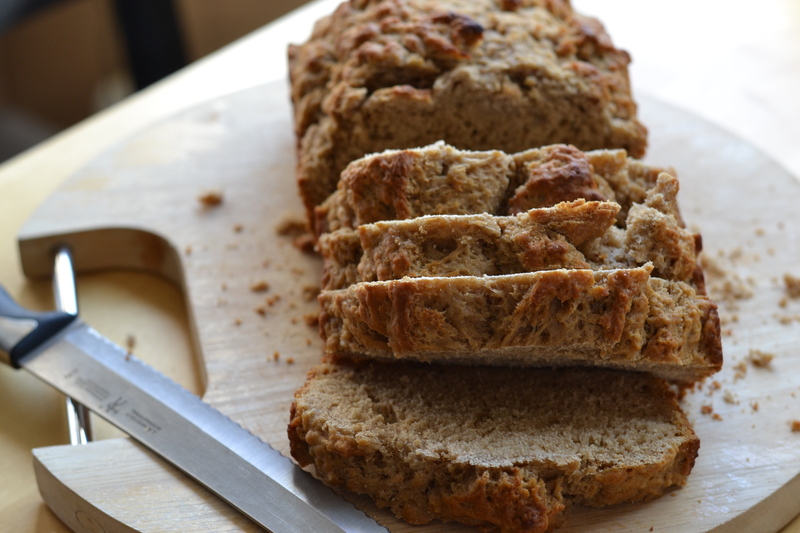 I had no caraway seeds at all though – and this recipe called for them. So…I just pretended I didn’t even see it, and left them out entirely. 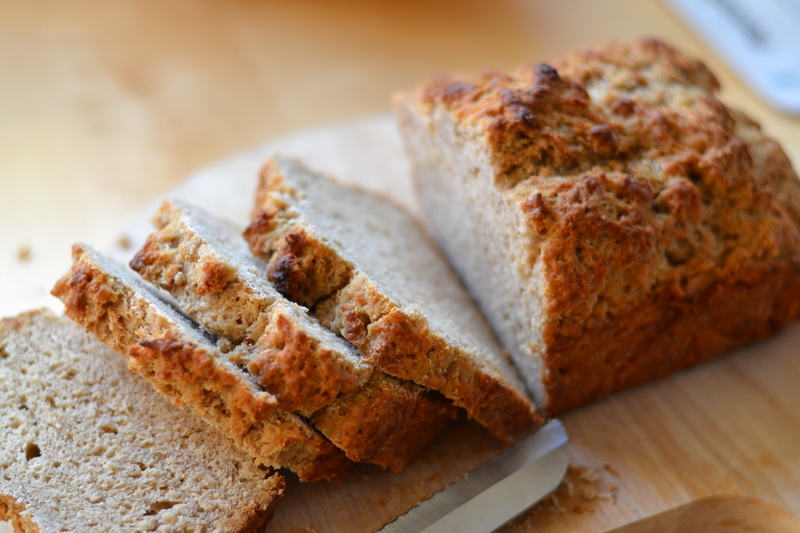 In the end, my modified version of the hand-written recipe yielded a soda bread that was wickedly delicious and gloriously golden.. Hours later when my boyfriend came home from work, the first thing he said was “The house smells amazing!” So, if you’re feeling lucky and want your house to smell amazing too, here’s the recipe. Happy St. Patrick’s Day! Preheat the oven to 350. Sift the flour into a large mixing bowl. Add the sugar, salt, baking soda, baking powder, and whisk together. Add the raisins. In a separate bowl, beat the eggs, then add the buttermilk, butter, and vanilla, and combine. Make a well in the center of the dry ingredients in the large bowl, and pour the wet ingredients into the well. 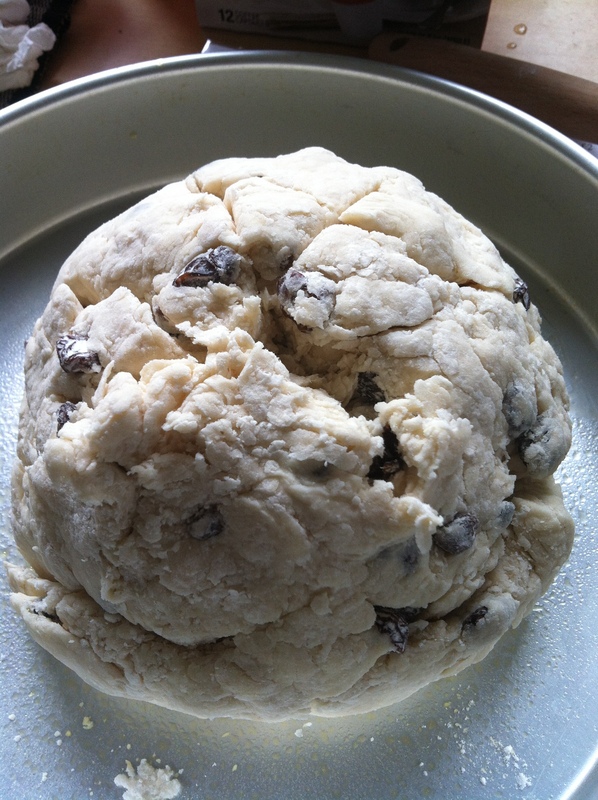 Mix with a large spatula, until a dough forms. 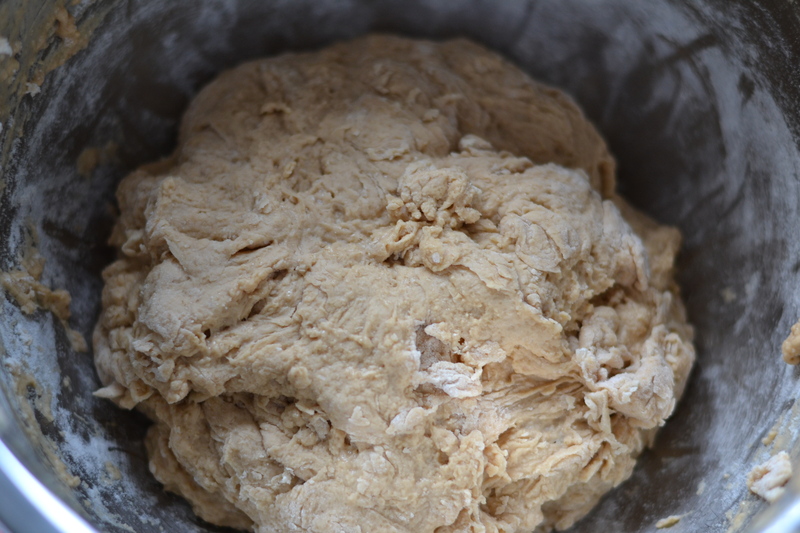 Knead the dough a few times, and shape it into a rough ball. Place the ball on a baking sheet, covered with parchment paper. With a large serrated knife, cut an “X” across the top. Bake for 50 minutes, or until an inserted skewer comes out clean. I am at a point where I can’t decide what to bake. I have four things in mind, and each sound fantastic in their own way. 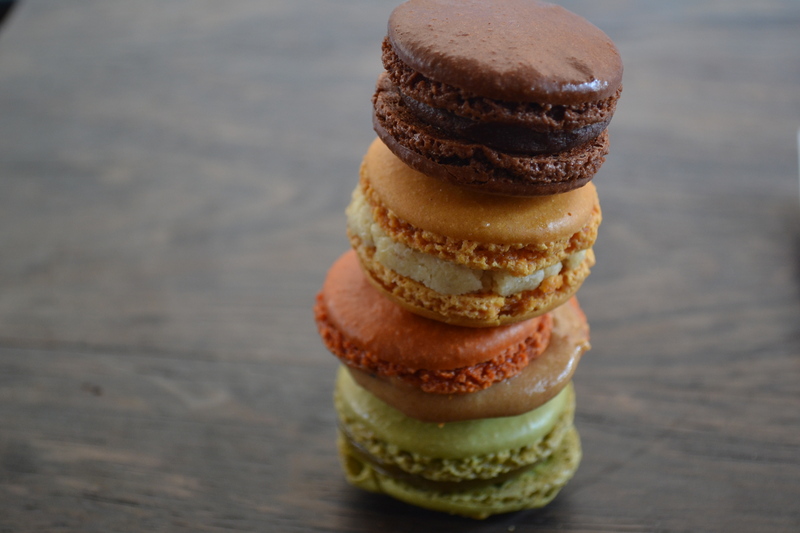 Each are also very different – some more sweet, some more savory; some more dense, some more fluffy; some look pretty, some honestly, kinda don’t. Three of them I’ve made before; one I have not. One was a request, the others are just because. So…what should I do?? Maybe you can help. This is one I’ve made before (actually twice before). 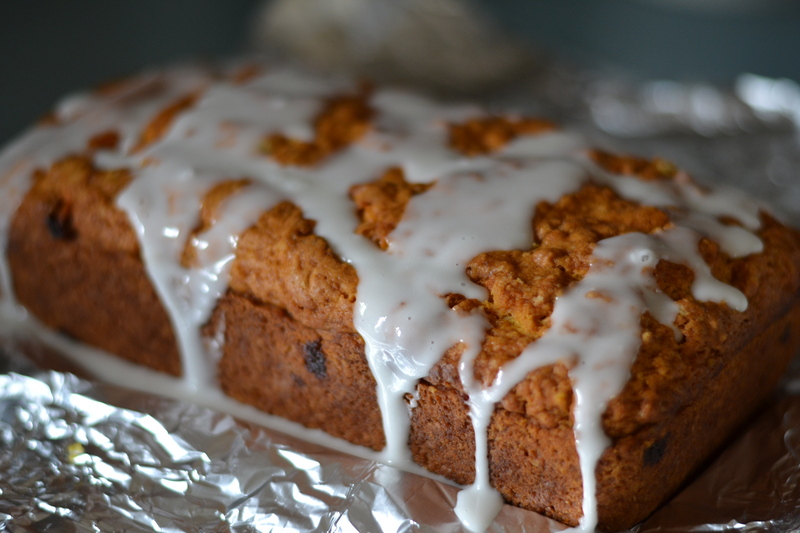 It’s rather light, not overly sweet, kinda crumbly, and full of raisins. It’s also timely, with the pending arrival of St. Patrick’s Day. Did I mention how tasty it is? This one I’ve also made before, but apparently have never written about it. I was sure I had posted it when I made it last, although that was about 3 years ago, when I was just starting the blog, so I suppose it was overlooked. So that’s actually giving it an edge here. Also, my boyfriend is obsessed with fancy beer, so I have plenty of fun options to get creative with this time around! I have never made this, so i have no photo to provide. I have eaten it, and I have loved every bite. I have researched recipes, but they all seem pretty different, so I’m a little lost at where to start. The one that I’ve eaten and savored sort of reminded me of a cheese danish. 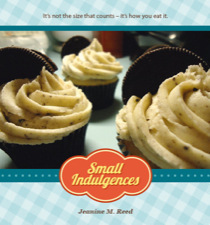 But some recipes don’t even have any cheese products in them – so what am I to do?? I did come across one recipe that sounded like it would yield a very close result to the cake I call King. And I love a good experiment. So there’s that. So, there you have it. Four very deliciously different paths to head down, all leading to very equally appealing results. What’s a baker girl to do?? Help! Pick a Pizza, Win a Prize! You can never have too much pizza. At least, I can’t. I know it’s cliché, but pizza really has been one of my favorite foods since I was like, born. Maybe because it’s just so versatile, that you really could never exhaust all of your potential pizza options in one lifetime. Maybe because it’s also as much fun to make as it is to eat. On the heels of our recent pizza-making team effort, my boyfriend and I decided to try our hands at another pizza variety. We used the same crust recipe and the same sauce recipe, but this time let the sauce cook for a few hours in the crock pot. 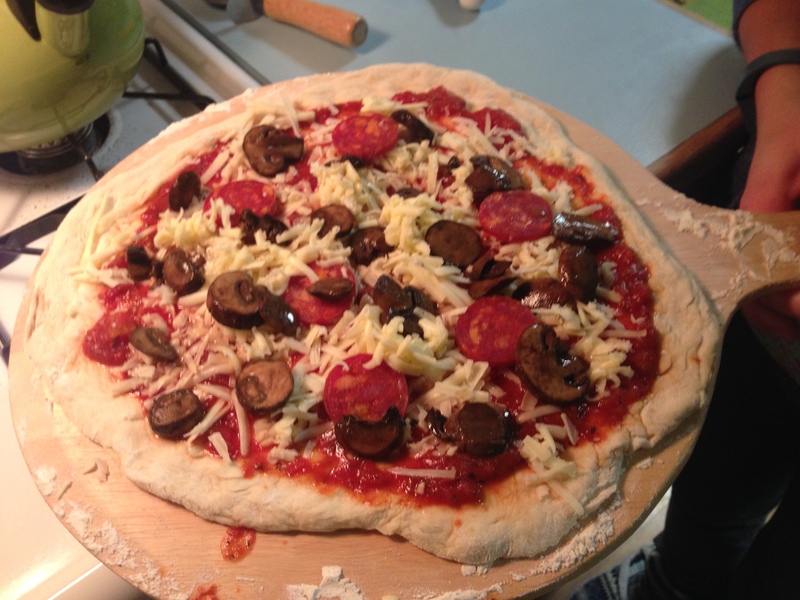 We also switched up the toppings, like you do, and for this one, went with pepperoni and mushrooms, and used a mix of Havarti and mild cheddar cheese. 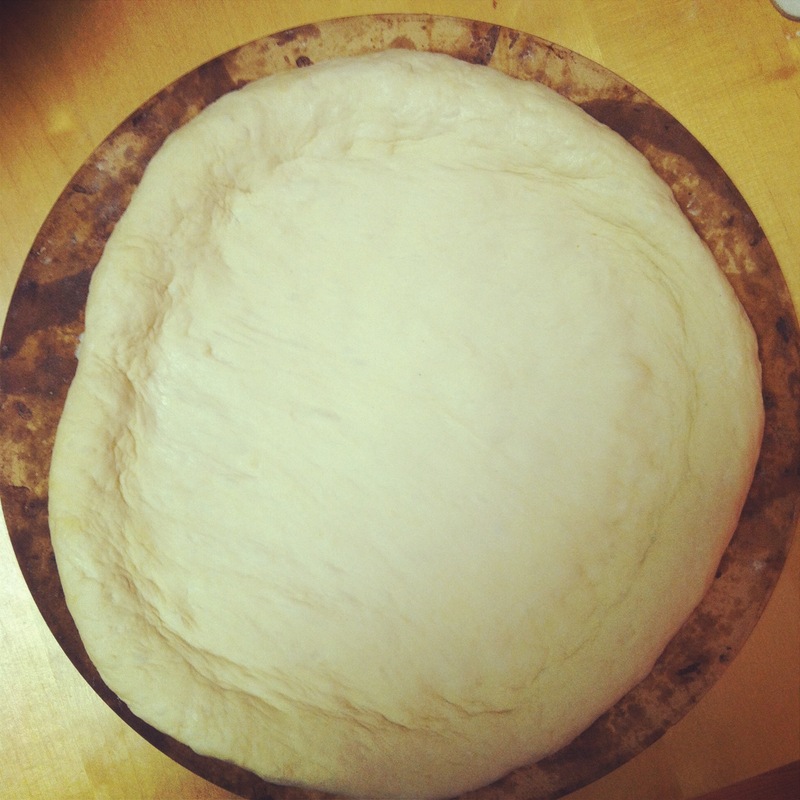 Oh yeah – and this time we also rolled out the dough much thinner, and made two thin-crust pizzas, instead of one giant extra thick and puffy one. 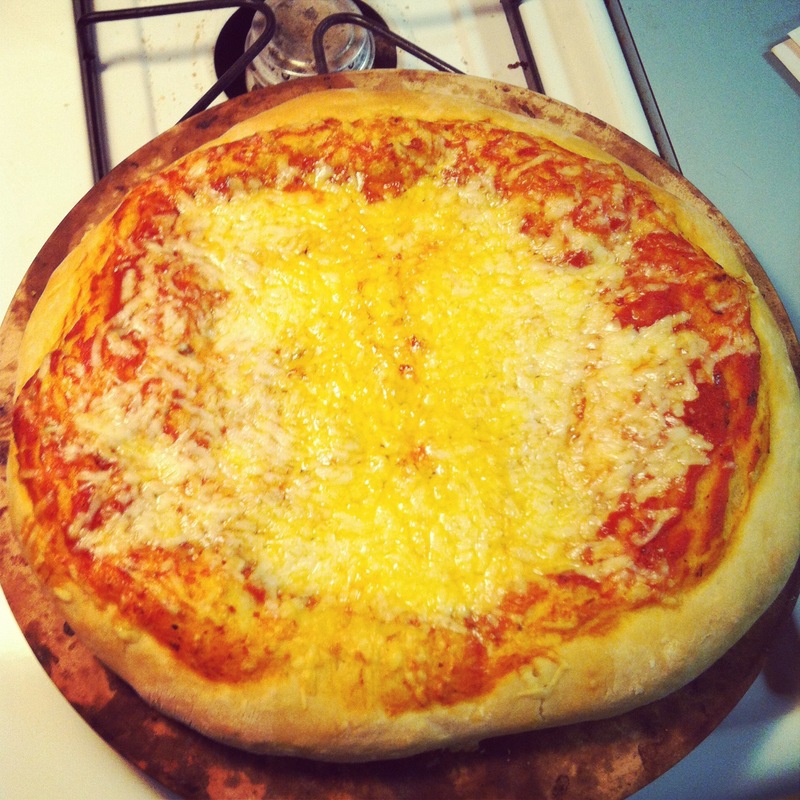 Having not one, but two crusts made it into a little friendly pizza-making competition. We each rolled a dough, and topped it individually, and baked them, one at a time. I was off yesterday (I love having Monday off – just saying), so in between laundry, yoga, and cleaning, I decided to make pizza dough. 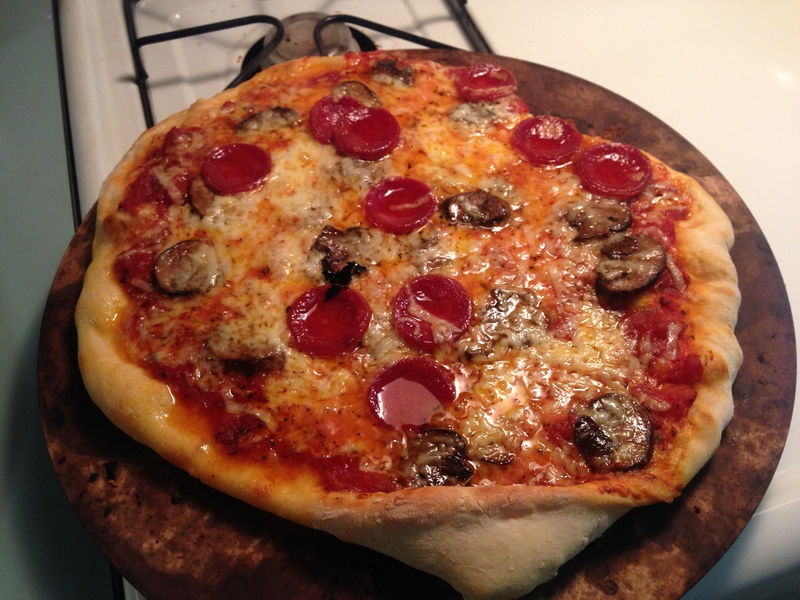 I hadn’t make pizza at home in a long time – probably not since pastry school, I reckon. So I thought I’d give it whirl. 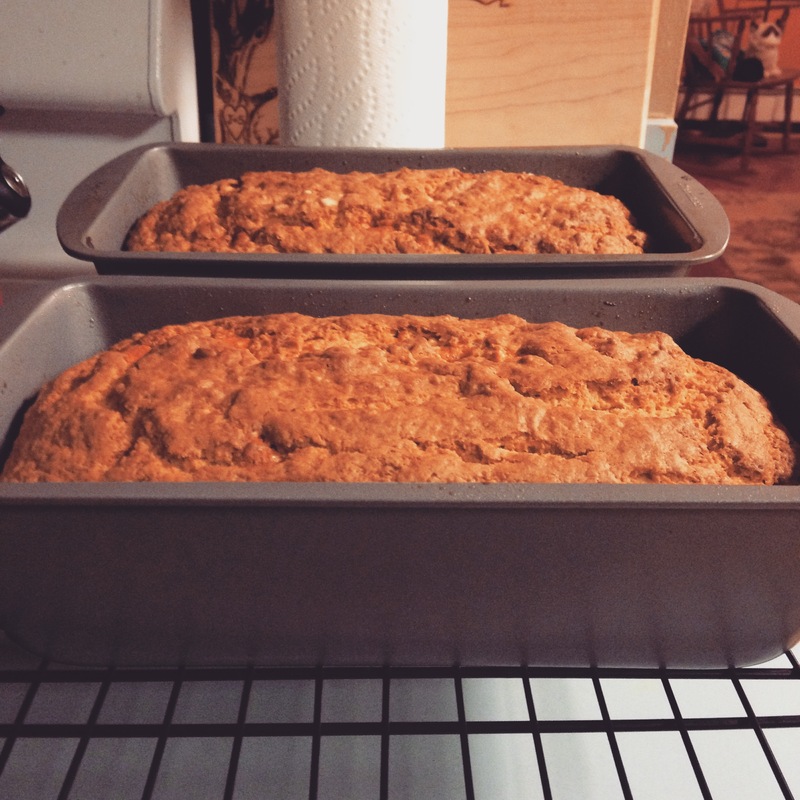 I used my favorite recipe from bread making class (which was also my favorite class). I had all the ingredients on hand luckily, including dry yeast. 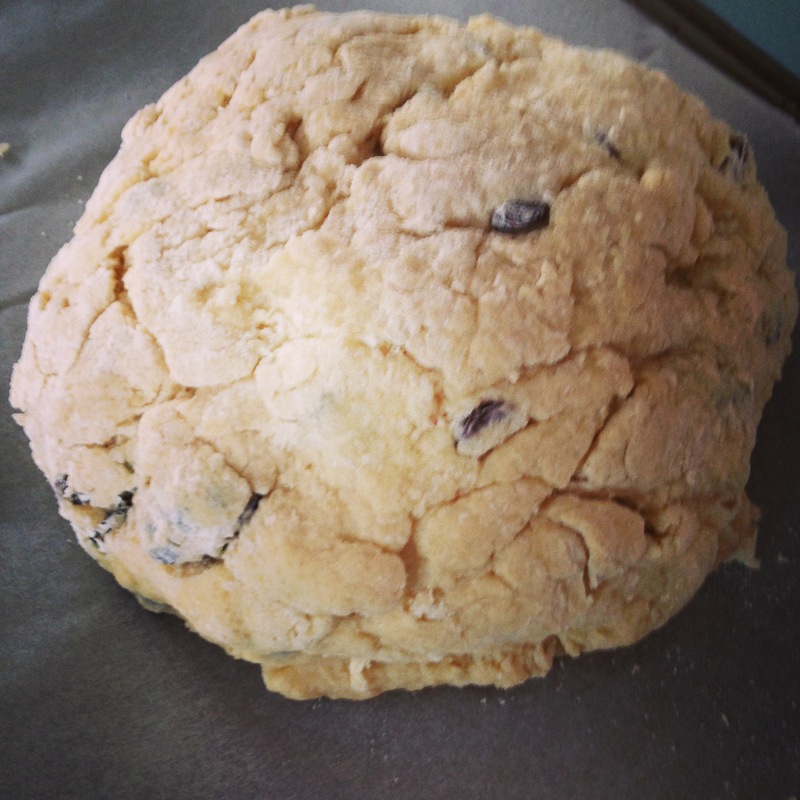 So, I made the dough, and put it aside to let it proof for about an hour, while I (reluctantly) finished my chores. When I came back to check on it, it had risen rather nicely. 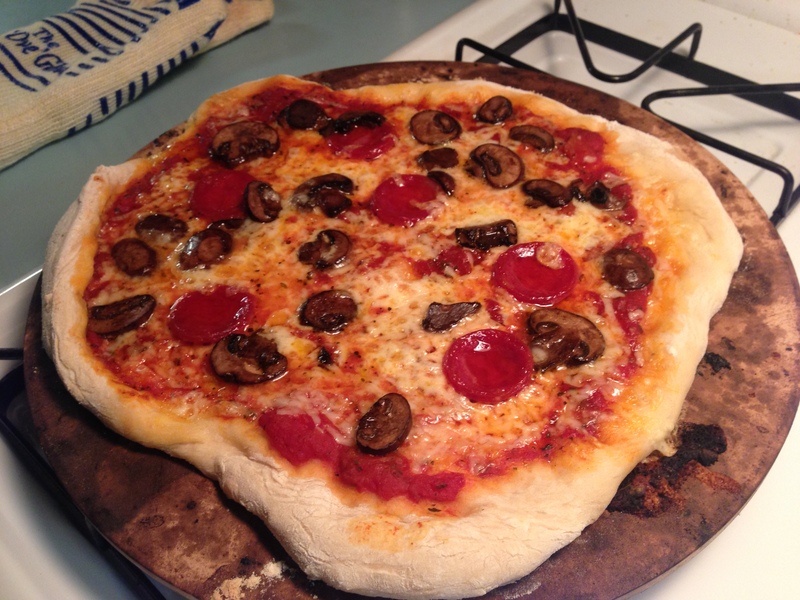 At this point, my boyfriend arrived home, and I shared with him the joy of the proofed pizza dough. We had a (slightly heated) debate about what to put on top, and it was at that point I realized I wasn’t very good at making sauce, while he apparently was. So, while he made the sauce, I rolled the dough onto the pizza stone. 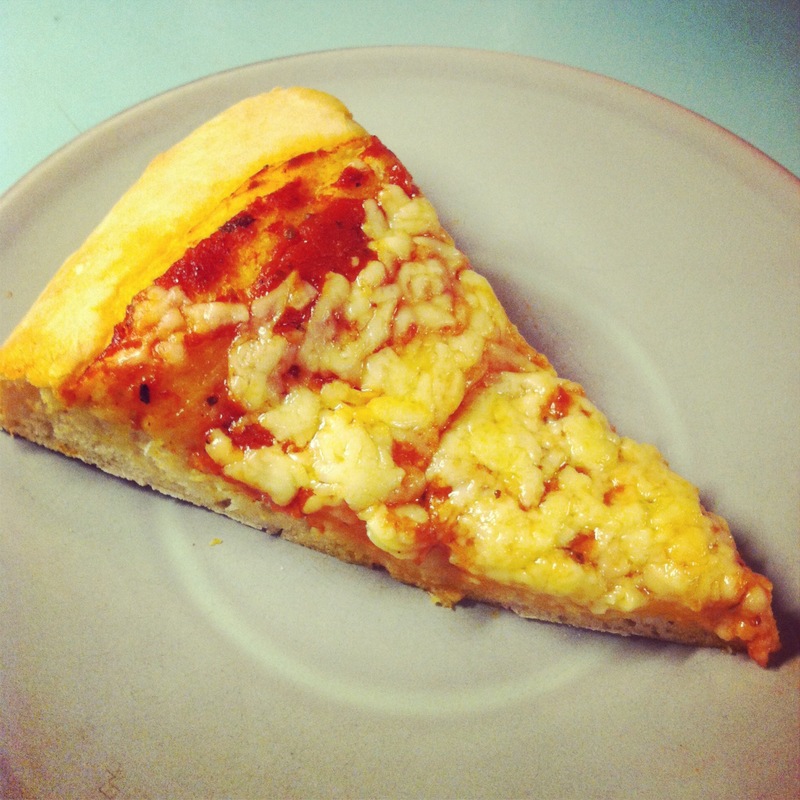 We always have an assortment of cheese in the house, but we really didn’t have any traditional pizza topping cheese. We did have a whole wheel of mild cheddar. So, he shredded some up, we put it in the oven, and then hovered around, hoping for the best. It looked real nice. That was a good start. But how would it taste? I let him do the honors of slicing it. We each took a piece, and proceeded to chow down. a little slice of love. We ate the entire thing – the two of us. Let’s just say the teamwork paid off. And all we had to do was add one extra ingredient that we always have around the house – love. 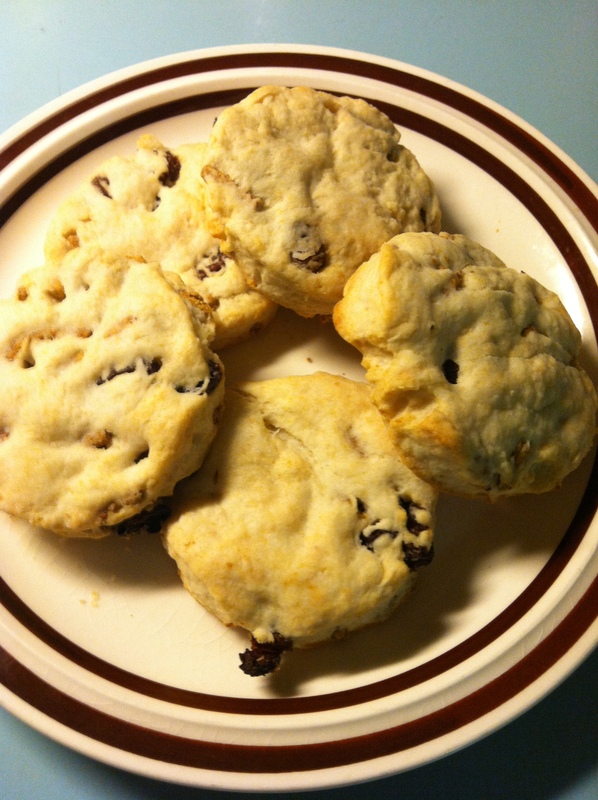 Healthy Biscuits to Help Stamp out Hunger! Howdy folks! I’m taking part in the fight against hunger along with 100+ food bloggers today. Hunger is a real problem, right here in our country. The average food stamp benefit is $3 a day to spend on a meal. This is barely livable and UNACCEPTABLE! When money is tight, folks are going to get as much as they can for it; and sadly, the cheapest foods are often times the least healthy. You can help! Send a letter to congress asking them to support anti-hunger legislation by clicking here. It only takes 30 seconds to make a difference! I’m primarily a dessert maker, but I make many breads as well. I came up with a recipe that’s budget friendly, made with pantry staples found in your local grocery store, and contains protein and natural foods that are good for you and not to mention, filling. And, it also tastes great! Take that, processed cheap food with empty calories and no real health benefits! Before I share my creation, I wanted to take a second and ask that you watch this trailer, for “A Place at the Table” now showing in a city near you and on iTunes. Please take the time to see this movie – it will change the way you think about food and hunger. The issue is real, and YOU can help!! Preheat the oven to 350. In a large bowl, combine flour, baking powder and salt. Cut in the shortening until the mixture has a fine crumb texture. 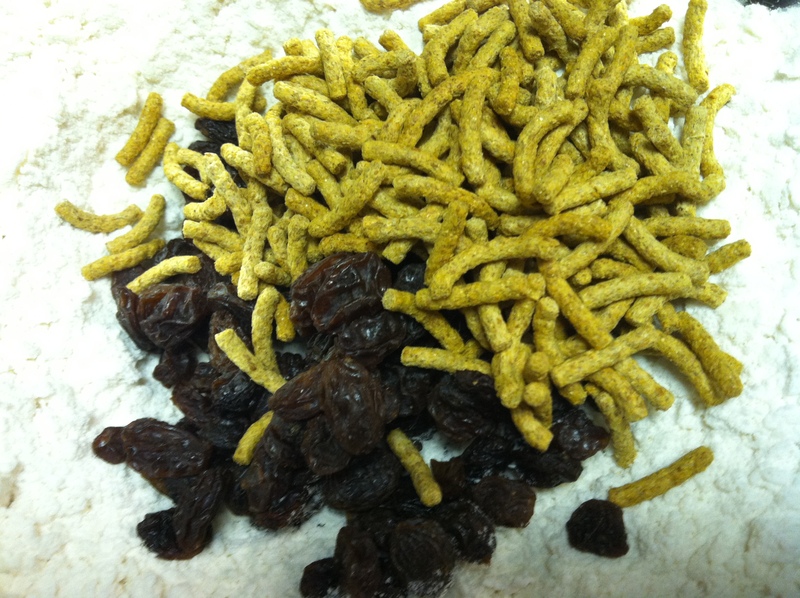 Mix in the raisins and cereal. 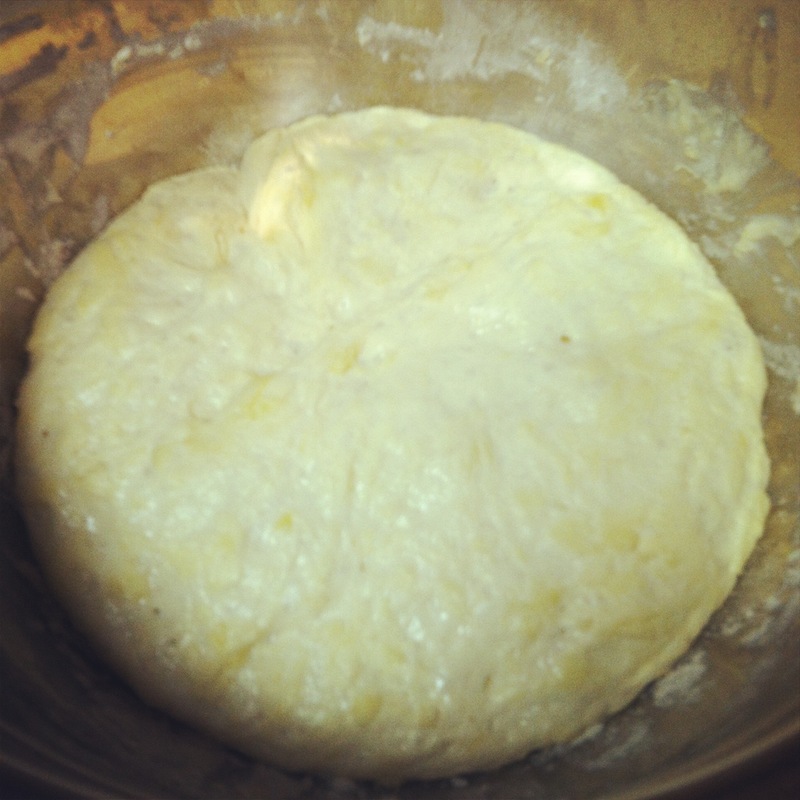 Stir in the milk with a fork so it makes a soft dough. Knead the dough with clean hands about 10 times – do not overknead – it will become too stiff! Roll it out on a lightly floured surface to about 1/2 inch thick. Using a round cookie cutter (or a glass turned upside down) cut out biscuits, and place them on a greased cookie sheet. 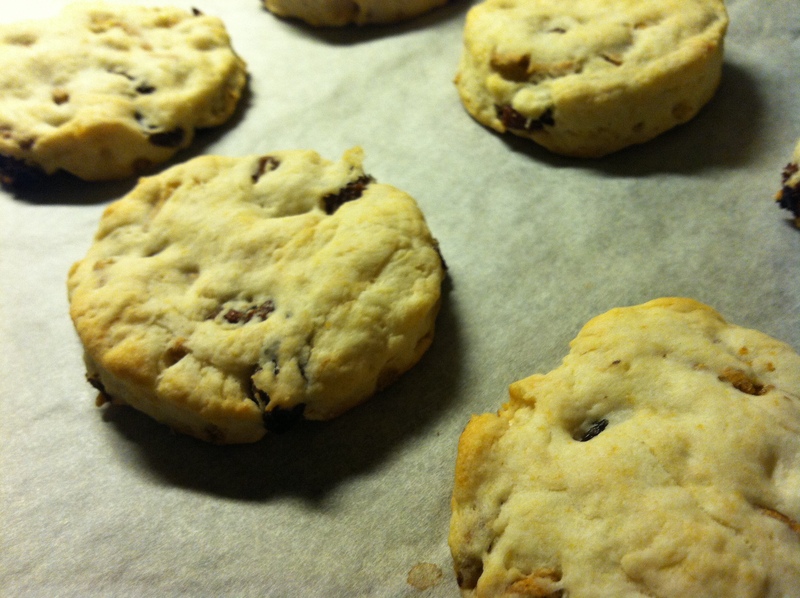 Bake for 12 – 15 minutes (or until the edges being to turn golden brown). Makes 22 – 24 biscuits. Serve with butter or jam, or enjoy them as is! 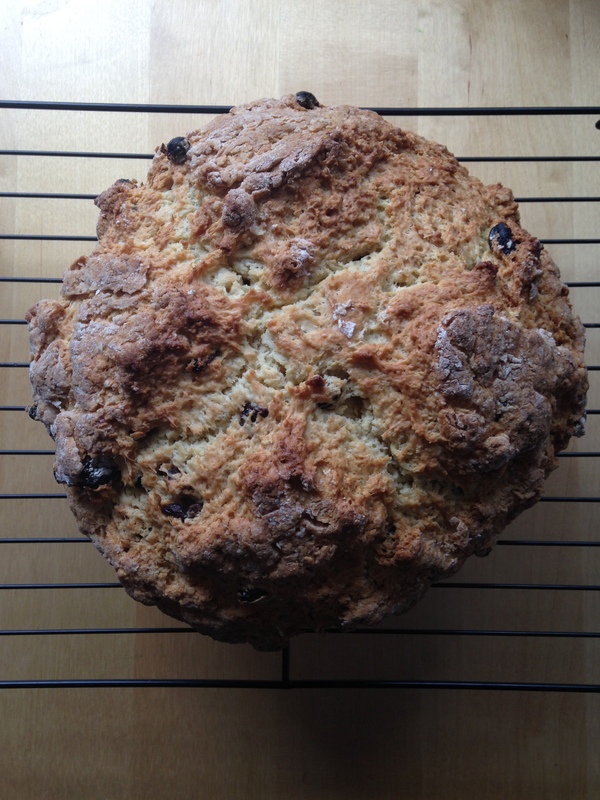 The Second Annual Baking of the Irish Soda Bread. 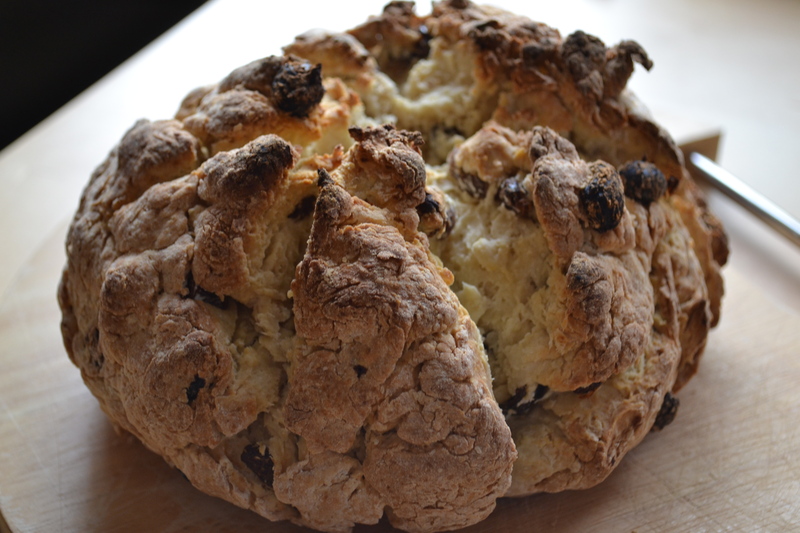 I realized after making Irish Soda Bread for the first time last year for St. Patrick’s Day, that I was going to have to make a tradition out of it. So, last week, I dug right in and attempted to recreate the very same bread I made this time a year ago, using the same recipe as a basic guide. The only difference this year was that I had a sweet new wooden spoon that my mom gave me for Christmas that I hadn’t even used yet, and a shiny new gigantic mixing bowl that I had picked up specifically for mixing doughs. 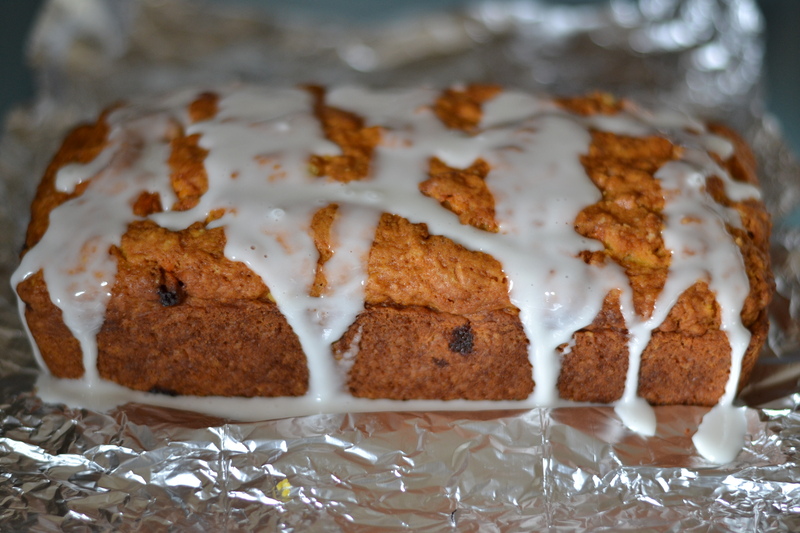 One thing I did remember was that I baked last year’s in a cake pan – so I did that same thing again. It keeps it from getting flat. cake pans are not just for cake anymore. It definitely did NOT get too flat – it rose quite nicely and retained its round-ish shape, like a good dough should when it’s baked into bread. I will say this – I think I let it bake just a few minutes too long. It didn’t burn, but if i were to do it again, I’d have taken it out of the oven 5 minutes earlier. It was still really tasty, and looked kinda awesome, close up. Happy St. Patrick’s Day! Until next year….